We have seen an unexpected growth in the field of digital and social media, but still, emails play a very important role in communications. Businesses have to send thousands of emails in order to perform many crucial business functions and deals. But still, there are many organizations who are using free emails services like Gmail, Yahoo, etc. for their business communications. Even though these free email service providers provide email accounts for free but they use suffixed with the service providers’ extension, which indicates that they are using a free email hosting service. What is a Business Email? Business Emails is simply an email which you can use especially only for your business. It normally includes an extension of your company names such as sales@yourcompanyname.com and every one of your colleagues will have their email address formatted in the same manner. Why Should You Get a Professional Branded Email Address? What does your email say about your business? When you have a professional branded email address like sales@yourcompanyname.com, it creates a bigger image of your business. And a free email address like Gmail or Yahoo mail can convey that your business is new or small or part-time or may think that you are not much serious about your business. Having a professional branded email address for your business creates a more professional image and can help prevent awkward situations where your potential clients may not take your business seriously. Additionally, setting up multiple email addresses for different segments of your business can help support and established professional image you need. info@yourcompanyname.com for any information about your company, etc. So, if you think branding was only meant for a large enterprise with big advertising budgets. You are never too late to start building your brand and can get started today by branding your own business email for FREE. What is Zoho Mail Service? Zoho is an Indian based software company that focuses on the development of web-based tools and information technology solutions. Zoho provides an unusually very large array of web-based software solutions, which includes an office tools suite, internet of things management platforms, and suits for IT management software and an email service, etc. Zoho Mail is an email service platform, which not only provides ad-free, clean, minimalist interface with powerful features that can be used to gear your business and professional use for FREE. Filters: You can create your rules to highlight your emails for a specific person and automatically move them to a specified folder and also manage your incoming emails and automate tiresome tasks. Scrub: You can quickly clean up your inbox by deleting or archiving your emails at once or you can select up to 5 senders and use the Scrub feature in order to archive or delete all emails from any folder. Keyboard Shortcuts: It has more than 50+ shortcut keys, which helps to navigate around your inbox easily. Folder Specific Notifications: You can select a particular folder(s) for which you would like to be notified. List Emails from Senders: You can find emails from a specific person without searching for them and see all the emails you have received from that particular person. Templates: You can create a reusable email template for your emails that you send frequently or repeatedly. How Much Does Zoho Mail Cost? Zoho mails have a very affordable pricing plan for its integrated suite of 9 applications. Step 1. Go to Zoho mail service and click on SIGN UP NOW. Step 2. On the next page, scroll a bit down and select Free Plan which is listed below the paid service. Now enter your domain name and account information, and then click on Add. Now, you will have to verify the domain that you have entered. You can verify your domain with three different methods such as CNAME Method, TXT Method, and HTML Method. I have used CNAME Method to show the verification process. Later, I will update this tutorial with the other two methods as well. Step 1. Login to your GoDaddy account and got My Account, select the domain that you want to verify and click on DNS in order to expand the DNS manager. Step 2. Next, the DNS manager page will open up with some existing DNS records. Scroll down a bit and click on Add button to add the DNS record. Step 3. Select CNAME from the Type drop-down menu. 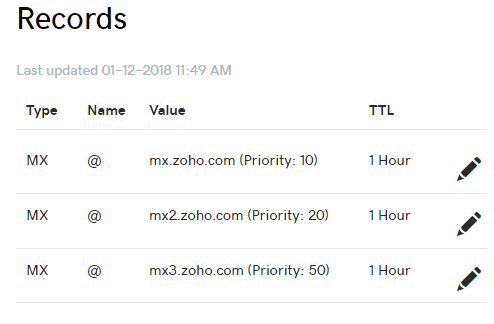 Enter the unique zbcode (zb*******) generated for your domain in Zoho Mail in the Host field. In the Points to field, enter zmverify.zoho.com. Step 4. Now head back to Zoho mail account and click on Verify by CNAME at the bottom of your screen. Step 1. 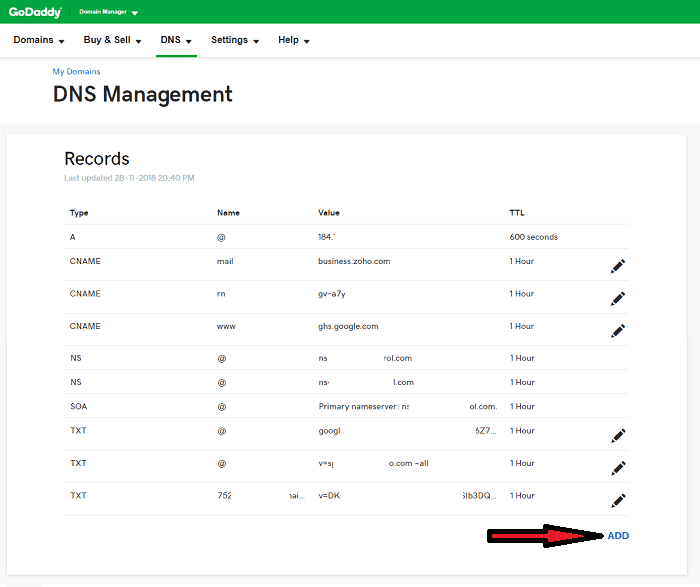 Login to your GoDaddy account and go to My Account, select the domain that you have integrated and verified with Zoho Mail Service and click on DNS in order to expand the DNS manager. Step 2. Now, scroll down a bit and click on Add button to add the DNS record. Entering Mail Exchanger (MX) Record details. 1. Select MX from the Type drop-down menu. 3. Enter mx.zoho.com in the Points to field. 6. Click on Add in order to add another MX record and enter mx2.zoho.com in Points to field and enter 20 in Priority to. 7. Again click on Add and enter mx3.zoho.com in Points to field and enter 50 in Priority to. So, you have to add 3 MX records to your GoDaddy DNS manager. You can also check the MX record with a third party tool called Mxtoolbox. Note: In order to receive emails on your new Zoho mail, you have to delete all the MX records related to your previous email provider as it will conflict with Zoho mail MX records. And this might affect in your email delivery or may permanently loss emails delivery also. These changes will complete your mail record setup process. It generally takes around 30 minutes for these changes to take effect, and when your Zoho mail is activated, cPanel will look as below. And you can start sending and receiving emails from your new business email address. In the next window, you can set up as many as 25 free business email addresses. You’ll start with your own email address, which will also serve as your login. Next, you can create accounts for your employees, and create email “groups” which forward messages to multiple inboxes at once. You can make changes later, so don’t worry about setting everything up right now. These changes will complete the mail record setup process. It generally takes around 30 minutes for these changes to take effect. According to me, Zoho Mail Service is one of the best options not only for business owners but also for bloggers, who are startups just like me. Now, head back over to your Zoho mail and enjoy sending and receiving emails from your new business email address. And if this tutorial was helpful to you, leave a comment below and please do us a favor by sharing this piece of content on social media sites. Krish good deal buddy. Always helps to cut costs.